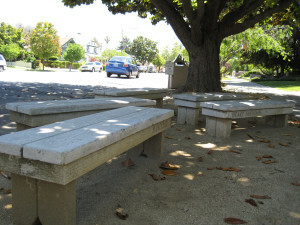 Simply by strolling around Japantown, you can see many benches installed using funds from SB307, a bill that passed giving funds to the three remaining Japantowns in America to preserve the Japanese-American culture. Each bench provides information about the historic significance of that site. Read them all to get a feel for what life was back then! 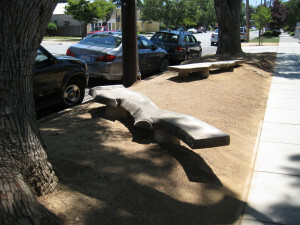 This was a project spearheaded by the Japantown Community Congress of San Jose. There are many other landmarks sprinkled throughout Japantown. Five different resting areas were designed to represent five core parts of Japanese-American history: internment, festivities, farming, immigration, and culture. The Ikoi no Ba are peaceful places to stop, relax, and reflect on the Japanese American history and culture. 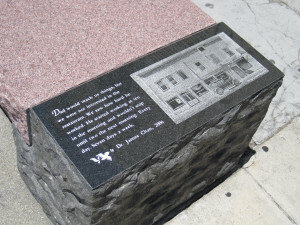 In the intersection of Jackson and 5th, you will find three key landmarks. 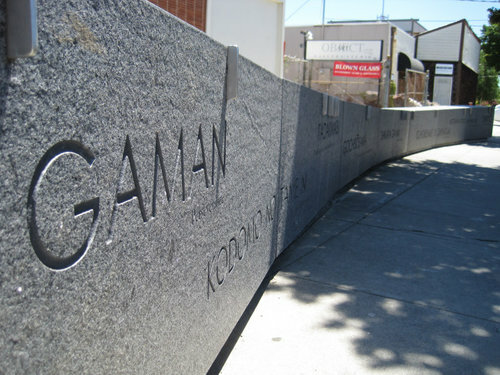 The first is the Issei Voices, a 36 foot horizontal granite monument, that echoes the words and phrases of the first generation Issei pioneers who instilled deep, binding values and traditions in the second generation of Nisei. On the top of the monument is a timeline of historic milestones in JA history. The Issei Pioneer stone, an 11,000 pound granite rock from Inujima Island, made the arduous voyage across the Pacific. This route symbolizes the journey of the Issei immigrants a century ago. The Issei Stone is a gift from San Jose’s Sister City, Okayama, Japan. its strength and durability are a permanent tribute to the courage and perseverance of the Issei pioneers who settled in San Jose’s Japantown. The Nikkei Lantern is best viewed in the darkness of the night. Guiding lights along the length of the lantern reflect the optimism of the Nikkei generations, ending at the top with a torch, symbolizing eternal hope. Etched in the bend of the lantern is”February 19, 1942,” the date Executive Order 9066 was signed. This bend symbolizes the profound stress and dislocations imposed upon Japanese Americans during internment. 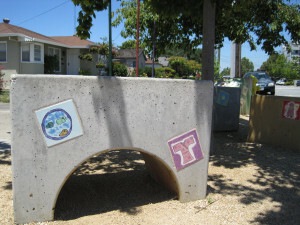 Each landmark represents the strong community that resides within Japantown today; some of them were even created by locals such as Ken Matsumoto of ArtObject Gallery. Outside of the Issei Memorial Building you will find the Civil Liberties Monument. This monument complements the Internment Ikoi no Ba at the Issei Memorial Building. It is one of the three monuments commemorating the only three Japantowns remaining in the US: San Jose, San Francisco, and Los Angeles. 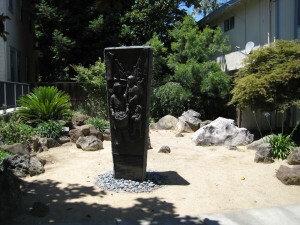 The three sides of the monument depict the history and experiences common to all three Japantowns and Japanese Americans in general: Immigration and Settlement, World War II Internment, and Celebration of Festivals. While walking around Japantown, try to find all of the monuments! Each landmark honors a specific part of the Japanese-American history, and brings the current JA community closer together.